Following a three-week extended break with no matches on the tour, Novak Djokovic scrapped by to reach the third round in Rome and maintain his quest to defend the title. His campaign will continue on Thursday, where he is scheduled to meet Brazil’s Thomaz Bellucci for the third time on the ATP World Tour. All their previous meetings took place on clay, including one in Rome five years ago. The Djokovic vs Bellucci Head to Head stands at 2-0. 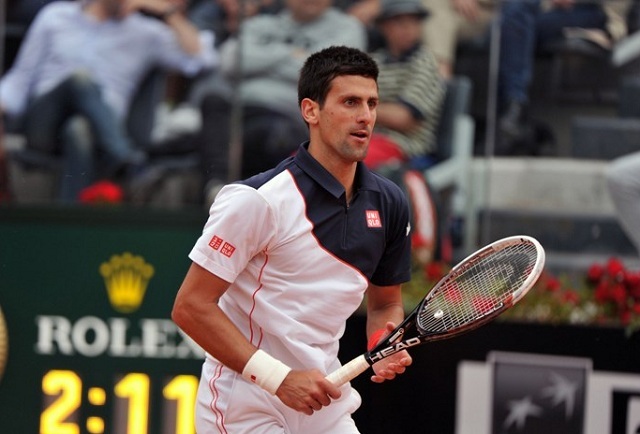 After lifting the Monte Carlo title and extending his win streak to 19 consecutive matches, Novak Djokovic found himself struggling on court against Nicolas Almagro in his opening match in Rome. While the contest lastesd over two hours, Djokovic was able to recover from a second set slump to win the match 6-1, 6-7(5), 6-3. Even the break he converted in the final set came off a net cord at while up 4-3 on Almagro’s serve and his ace count was matched by his Spanish adversary (11). “At the end of the day it’s a win after three weeks with no official match,” said Djokovic. “In the important moments today, I did feel a little bit uncomfortable. Maybe that’s due to a lack of competitive play in the past couple of weeks. But I won against a quality player, who knows how to play on the big stage. All in all, it was a great test. Before coming to the court, I was aware he was going to present a great challenge. Djokovic will come up against Thomaz Bellucci, who reached the third round of the Internazionali BNL d’Italia following a three-set victory against Roberto Bautista Agut. He struck six aces, won 78% of his first service points and saved three break points to rally back to victory 1-6, 6-1, 6-4. It was an impressive win for the Brazilian and sets up his encounter with Djokovic. This marks the third time that Djokovic and Bellucci will meet on the professional tour but also the first time in nearly four years. Djokovic leads the series 2-0, both on clay, including one at this very event five years ago. While Djokovic did not look his best in his first match, he will have likely shaken off the rust and will be prepared to advance to the quarter-final in straight sets.